Home EXERCISES Rotator Cuff Exercises To Get Good Relief From Your Shoulder Pain! Rotator Cuff Exercises To Get Good Relief From Your Shoulder Pain! Are you experiencing sleep less nights with a sharp pain in your shoulder or upper arm? This can be due to rotator cuff injury. Practicing regular rotator cuff exercises can prevent you from this severe and disgusting pain in your shoulder. Rotator cuff usually consists of four muscles that mainly help you to lift your arm and rotate it away from your body. These muscles also help in moving the head of your shoulder bone during elevation of arms. Mostly, these muscles are more prone to inflammation and swelling during overhead activities. So, in order to reduce these swellings and tears it is very essential for you to practice rotator cuff exercises. Before starting these rotator cuff exercises, warm your body so that you can feel better. Some of rotator cuff exercises are discussed here. Try to follow under the guidance of an experienced physical trainer. Start the exercise by lying on your stomach either on bed or on table where ever you feel comfortable. Then stretch your left arm out to shoulder level with your elbow bent at right angled position (90 degree) and let your hand down. Next, keep your elbow bent and slowly start raising your left hand. When your hand level reaches to shoulder, stop rising and then slowly lower your hand down. Repeat this process until you feel tired with left arm and then repeat the same process for your right arm. First lie on any of the either side of your body on a bed or a table where ever you feel comfortable. Stretch your upper arm at your side and bend your elbow at 90 degrees and then rest your forearm against your chest and palm down. Try to roll your shoulder out and raise the left forearm until it reaches to the level of your shoulder and then slowly lower your hand. When ever you feel tired with one arm, start with other one. Start lying down on left side of your body and then try to keep your right arm along the upper side of your body. By bending your elbow at 90 degree to your shoulder, keep your right forearm in rest on the table or in place where you are lying. Now rotate your left shoulder in, by raising your left arm up to your chest. Repeat the same process with other arm. Previous articleBalance Exercises To Build Leg Muscles And Prevent Falls! Next articleSprinting: Best Way To Reduce Your Excess Body Fat! 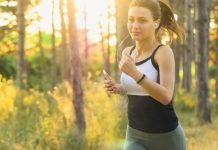 Why Warm Up Exercises Are Essential Before Starting Any Fitness Workout?